A trusted advisor to pose you to bring our your best self, know how to corral a group of kids, catch a great laugh without dirty dishes in the background and help you figure out what to do with all these photos. A mom to 3 energetic boys and wife of a computer guru, there is little your crew could throw at me that I haven't dealt with already. Lets get them documented! Print your Family Photos Connecticut! A box arrived from my best friend. Always a delight (she’s a master gifter), I wore a full smile as I ripped the package open promptly burst into tears. It was an image of my 3 little boys she downloaded from my Facebook and made into a canvas! The quality was a bit off, but I was so surprised it did not matter. That was 7 years ago. Before then, I didn’t consider the value of a printed photo. It still sits on our fireplace mantle that image that I made with a small digital camera that boasts less megapixels than our smartphones. A snapshot that showed me my boys during a slice of time that is now even more important because it was printed. Such an experience changes the way you feel about yourself. I remember that day and worrying about the baby falling forward. It was cold and I didn’t want to leave the house, but I took them all out to the pumpkin farm nearby. They had some cool chairs and I had them all dressed to match so even though it was so long ago Pinterest couldn’t guide me. I thought awe, they look cute. It was Facebook worthy, but I didn’t print it. I can’t explain why I felt emotional when I could touch it. I’ve since printed TONS of images of my kids. I have them on my mouse pad, mugs, all around the house. All that printing experience can help you. I have access to all kinds of ways to print through professional labs. On canvas, for a frame, on wood, under acrylic, on metal (great for the kitchen). 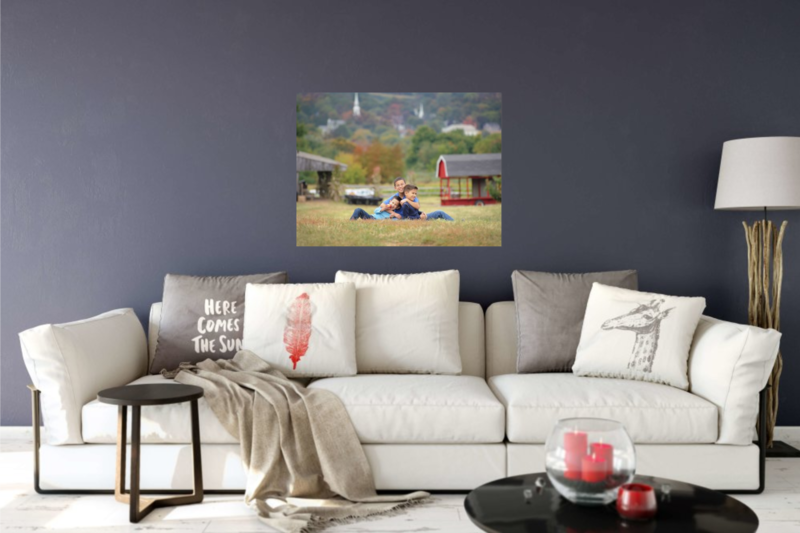 I have samples of my own kids and a program that lets me show you what your image would look like on the wall to make sure you get the right size. It gives you a change to try ahead and see if you like the configuration and images together. What would be more simple to get your images into your life? Once we are sure what direction you’d like to head, I take care of ordering and will preview the products with a discerning eye to be sure the quality comes through. Then you’ll receive the products directly. I’m happy to help with installation. Cause it’s just as exciting for me to see this awesomeness on your walls! If you want to chat about possibilities, send me an email at cruzsarah@yahoo.com. Of course, printing an image made by Sarah Cruz Photography guarantees image quality. However, I have made displays for people with their own images too. Don’t hesitate on a gift for yourself. Don’t let the season run away from you. Get a jump on your holiday cards. Images are typically provided in a password protected gallery within a week of capture. Want to know more about Dzen Farm? Read what it’s like to get a tree there. The farm isn’t open until the day after Thanksgiving. At certain times of the year, with fall being the most popular. Mini-sessions are needed to get a few images for Holiday Cards, sessions are shorter and booked one after another. They are good for those families that want updated family photos but don’t necessarily need or want to spend too much time required with a full photography session. 15-20 minutes for a photoshoot, no problem!! 2. What should we wear? Best tip… be comfortable in whatever it is you pick! I’ll send you tips and pointers. 3. When should we arrive? Because we book these mini-sessions back-to-back, there is little wiggle room. If you are running late I unfortunately cannot give you extra time during your session since it would push back each session following. Please plan to arrive 5-10 minutes early, that way we can be sure to get all the photos you were hoping for of your beautiful family! 4. How many people can I bring with me? These fall mini-sessions are designated for immediate families and their pets, You could book back to back sessions, but with extended family I would recommend a full session, at least one hour long. 5. Can I give or my mini-session to someone else? YES! Absolutely. You can gift or sell your mini-session if you are unable to attend. 6. How long before I receive my proofs back? You will receive your proofs back fairly quickly during the holiday season, I commit to a week. I understand most everyone will be using the images from the mini-sessions for holiday cards and gifts so I am focusing on a quick turnaround. Image proofs will be emailed via a private online gallery link for you to view and order from. You will receive the email within a week after your session. 7. Can I purchase more images then what is included in my package? Yes, you can purchase extra images that were not included in your package. 8. I want to schedule something outside of a mini-session because I would like to have an extended family shoot done. How do I schedule that? 9. What is your cancellation policy? If you absolutely cannot make your session and you cancel with at least 24 hours notice, you will receive a credit towards a future session. 10. What if it rains, do you offer a rain date? YES! Rain dates are always announced prior to booking. Please be sure you are available for both dates in the case of bad weather. If for some reason you cannot make the rain date and you cancel with more then 24 hours notice you can use the credit towards a future session. Include your pet in the family portrait. I felt my pulse rises as I imagined a humungous fella with big slobbery drool like the guard dog in Harry Potter. Knowing it was important to them I figured, we’d be outside, there was time to play, this was the dog’s family, it should be fine. When I arrived at the family session and dad walked around the corner with a tiny-puppy-sized-fully-matured-not-barking-dog under his arm, I started to beam a big smile. The family had a good laugh as I explained the treachery I would experience walking home in 1st grade past a lonely slobber fest of a teen dog that was kept in the yard all day and screaming to be played with when I’d walk by his fence. They were also delighted after the fact that their dog was looking at one of them or the camera in every image I sent them. So though I’m no where near a dog whisperer, I’m all about taking images of the family as a whole. My flexibility and willingness to try should relax you into seeing what we can get. I take enough images to be sure to get to our goal. It can be tricky to get everyone positioned just so and we have to have patience adding the unpredictability of dogs. I’ve had some people bring dog treats if we are in their yard or go to the park a full 1/2 hour ahead of our meet time so their furry pal can explore and get some energy out. Just like a small kid, bringing a dog’s favorite toy and a willingness to take breaks is encouraged. I’ve since photographed tons of families with their pets. On the beach, in their homes, at the park, at their grandparents… And though I’m still using allergies as an excuse against our youngest’s canine wish list, including a pet is not even a question. What a drag to get your image made for work, until you start talking about how you want to be presented. I love when people call and say they HAVE to get their picture, especially when they say they don’t like getting their image made. We all need to have a nice capture especially for LinkedIn which adds so much value to your profile. The pre session conversation is the key. Teresa wanted some images to show her approachable service to clients. So we decided outside rather than with a backdrop would be best. She put a thought into her outfit. The best idea is to match your outfit to your eye color, but she had amazing golden eyes, so a dark color felt right. This is our focus for a headshot. What feels right. Don’t go with anything too trendy which would date your image. Be considerate of the setting and then relax. This will project confidence. During our session, I will direct and advise. Naturally curious about people, I’ve been told I’m so distracting in conversation, there’s no getting self conscience because it’s over before you know it! I move a bit to be sure we have good light and ask you to try different locations, sit, stand, turn this way and that. Until I have a few choices for you to look through. The snow falling in huge chunky flakes was so graceful and peaceful falling with a hush, but it was already late March. Not a one of you wanted your families photographed in the confetti and my own kids were over it. Time to think outside the box by going into one! Giddy when Woodland Gardens in Manchester CT opened their doors to us. Their warning was that in April the greenhouse ‘is just starting to look good’. Wow. I mean the color was so welcoming and the air so fresh. So delighted when some of you braved the unusual idea with me to make some lovely images. Mixing it up was an exciting challenge, especially when I woke up to rain! All my wedding photographing experience had me ready to look at different angles, avoid the puddles and greenhouse equipment to make the expected clean and bright images of your relationships. The mini session vibe and end results are different compared to in-home or park sessions, but I still love love love them. Mini sessions are even faster paced than a full session with concentration typically on the immediate family but in a fun setting. We did pumpkins and leaves in the fall so spring was a welcomed new opportunity. No matter the setting, my focus always is capturing the family connection. Both types of sessions have a place in my business and on your walls. They both could work for your family too, it depends what you want the images to reflect. Need some updates to your wall or do you want a full complete story? Are you ready to talk about your own family session? I’m just a message away my friend 🙂 Contact me so we can get to talkin’. And if you think you’d like to do a mini session next time, keep your eyes peeled on instagram or sign up on my email list – I’ll be sure to share info without annoying you with junk. Promise! Momtography: Connecticut Camera Class geared towards moms. I’m a licensed teacher, how do you like them apples? Ha! This winter, I went through training to instruct a DSLR photography class designed with moms in mind. I needed to understand how to explain what I know in a structured way. After learning through a class myself and a few years of mistakes, it’s amazing how much I can share. It’s so fun to connect with other people who have a similar interest and typically are moms too. During our 4 hours of Momtography, there are lots of stories, laughs, sharing, slides, images to dissect, practice, some technical skills and my favorite a moment when people ‘get it’. It isn’t just my talking, you’ll have exercises to try and some time to work together. This class is great to take on your own or bring your friend. Come connect with us. When the day is done, you will have opportunities to stay practicing and connected with the other attendees. Also, a larger online community. I know motherhood can be lonely, but pursing a hobby with other people on the same journey is wonderful. You can find class detail at the bottom of this linked information sheet or shoot me a question at cruzsarah@yahoo.com or below. 5 Reasons why your family needs Christmas, Holiday or Photo Cards. As December approaches, I feel that pressing weight of that one needed image to represent our year. My goal was to grab it during the first snow, but th en we had a year without December snow and it completely stressed me out. So I threw the kids against a white wall of our house in their gear and that represented 2012. OR in 2004 when we dressed our oldest (an only at the time) as baby new year because it was so late. The first year we had 3 kids, our cards came out Jan 4th, the 12 days of Christmas were almost up, but we made it! Last year was the first time I hosted my extended family of 20 and I never sent any out. Cards get me worked up and after you get the image, you gotta go through all the provider choices, then all their options to find the most aesthetically pleasing with the image you have determined to use. Then there’s ordering, printing, getting them addressed, buying enough stamps, stamping, decorating and mailing. And yet, when the cards start to flutter into my own mailbox, I delight and look at the detail in each one and am so glad I did it. They are hung on ribbon on our kitchen wind, blocking the drafts and sparking a smile. Reason 1. You show people you care. So simple, I don’t even write in them. In fact, I printed labels so some my kids assembled for me. The effort though was made and I know someone we care about will check the mailbox and see something fun. Reason 2. You maintain connect with old friends and family. It’s always fun to look back and see families grow up, and then remember fun you had together when that 15 yr old in the card was 3. Reason 3. They force you to capture your family. Professionally or not, each family needs more images! And they give a personal spin to your holiday greetings. Reason 4. You see how your own family has changed. Of course I have a ton, but some of my favorite and most often posted photos were also those I used for our cards. That image at the top of the 3 in the snow is framed and printed on our hall wall, but also on my mousepad at my home office and matted at my work desk. One of my all time favorites and only came about because it was a make them today or forget cards this year day. Reason 5. Displaying cards is one of my favorite Christmas traditions. Visiting others’ homes, it’s fun to see their collections as well. My mom gathers hers in a basket which I curiously poke through. Some people put them on the door frame or make displays. So incase we didn’t get one out to you through snail mail, here is our 2017 family card. And below our awesome outtake. Some thoughts on making the most of your family photography session. I send tips on dressing and Pinterest links to help you, but choosing clothing helps determine the kind of images you will have. Soft and elegant? Chose neutral colors with soft, flowing fabrics…. think creams, very soft pastels, oatmeals, light browns, tans, grays, and slate blues. Fun? Choose coordinating bold colors like hues of gray with yellow or bright red accents. Add scarves, headbands, hats, or a prop like a flag. Some families have their hair and makeup professionally done. Whatever makes you feel most put together and true. The best lighting is the two hours before sunset and after sunrise, but I am able to shoot at any time of day. Many families come to a photo session and schedule dinner after. If this is your plan, be sure to give everyone a healthy snack before the photo shoot. I encourage drinks to be brought especially during the summer when we are meeting outside. Blankets and mittens if it’s the winter. Most teens dread the family photo session and some dads too, but I work fast and keep things moving. Most are pleasantly surprised. I’ve yet to be overwhelmed by a toddler either. I chat and interact with your children to get natural, gorgeous smiles. It really is painless and worth any anxiety for the time together and amazing photographs. If you are engaged as a family and loving on each other your smile will be natural. Knowing this will be shared with your grandchildren, you will be so glad that you gave this time to your family. Have fun with your family. Don’t be afraid to pick up your children and toss them in the air. Kiss your spouse on the cheek or whisper how much you love them Have fun. Laugh. Snuggle. Play. This captures emotion and relationship – your love through my lens. Incorporating an activity that the family loves to do together is an easy way to do this. When we meet at a park and the kids run or play that’s one aspect, but making something like a campfire is another. Its’ something to do with your hands, engages everyone, and brings an authentic smile to your face. Do you cook together? Let’s make something. Do you love to read together? Bring some books. Love to play board games or cards? Plan to play a round of cards during your family photo session. Other ideas include: bike riding, hiking, picnics – families that are engaged will have authentic photographs that reflect who they are. This will make the most of the photography session and celebrate your family to create images you love. For most, a family photo means a stranger’s snap in front of a vacation spot or the waiter when you realize everyone is together at an event table. Hiring someone for something you can do for yourself seems odd and yet we go to a restaurant or buy a pie at the farmer’s market for the experience and self reward. I reached out to some of my recent clients to get their feedback and included some more details on what the experience is like when we work together. After taking photos with her sister, it was Maddy’s turn to be alone in front of the camera. We had several outfits to go through a majority of them being natural, casual and sporty so our location was perfect. So was she, because this gal was willing to try lots of poses and looks. Flexibility and the a willingness to relax really makes for a good image, even when you are worried about getting poked by the grass or losing a bracelet in the field. That willingness to let go makes room for conversation while I’m coaching where to place hands or shift so the light hits just so. Props like sports equipment or a book gives provides something else to focus on and will mark the time you spent in high school in a way the yearbook may not. Yearbook formals through the school or as part of your session with me is a memorable way to mark the end of your time in High School. Celebrating what the time has meant to you and making a photo of that creates new memories. Congratulations Maddy and the class of 2017!